Textures and atmospheres from one-half of the noisy/ambient camp Windy & Carl is one of the most brutal and aggressive releases I have heard all year. 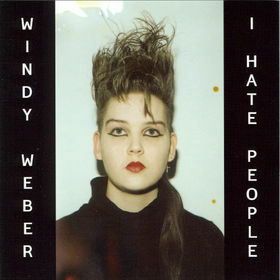 Entitled I HATE PEOPLE, Windy Weber’s newest recording is full of warm tones, beautiful distorted screeches and dark ambient voices drifting in and out of the listeners cerebral cortex. There is something unique and mysteriously provocative about drones and the ambience that comes crashing down with them. There are two tracks here, each one at least 15-20 minutes in length. The first one, SIRENS, is the one that hasn’t left my platter since i cracked open the beautifully packaged gatefold sleeve. Looking similar to a peacock pressed on clear vinyl, one can tell this is also a work from someone who appreciates artwork and has a special admiration for design aesthetics. The first few minutes are warm ambient washes of mellow tones that slowly wrap around the head like a therapeutic blanket. Once you allow yourself to be taken in, it’s all over; for the distorted and dirty screeches that still remain to be beautiful and disturbing in the same right have you by their rusty clutches and won’t let you go. On the flip is DESTROYED, and it truly does. A much more subtle and subdued listen, she starts us out with whispers and looped vocal treatments much like delicate chants and tribal particles fused with long breathing noises that flow into one another. Truly breathtaking and lovely. Together, I HATE PEOPLE takes someone to a cold, dark, foggy place that exists only between fantasy and that dimension that we allow ourselves to be a part of when honesty, hope, and grace just no longer exist, and the only thing we have left to hold onto and embrace, are pain and wonder. Check out this and other releases from Stormy records. see her montrous soul here.